The list of players who have reinvented rock guitar is a short one. Narrow the list down to the past 20 years and it gets even shorter. Whittle it further to players who have pushed the boundaries while attaining--and maintaining--commercial success, and you've got a virtual ghost town. All of this makes The Edge's contribution to the guitar vocabulary all the more astounding. His signature chimey tone, coupled with clever use of delay and sparse chord voicings, has spawned countless imitators. And the tone that resonated with millions--old-school rockers and defiant punks alike--sprung fully realized from U2's first album, Boy, in 1980. Incredible as that achievement is, The Edge has continued to refine and redirect his sound to serve the band and its creative evolutions--most notably for the edgy, lo-fi sonics of Achtung Baby (1991) and Zooropa (1993). Jr.)--who have created one of the most identifiable band sounds in modern pop music, clearly enjoying their musical interplay. At the time of our conversation, The Edge was in Dublin rehearsing for U2's upcoming tour. It was evident that he is excited about music, the new U2 record, and the instrument he helped redefine. GP: Did you intend to go for a more stripped down sound on ATYCLB? Edge: We're the kind of band that has a chemistry and a vibe when we play together, so we wanted to start the whole writing process with the band in a room. We quickly found our band sound to be very fresh--especially after the more electronic leanings of the last two albums. GP: This album seems to meld the other, more organic U2 sound with some of the electronic elements of Zooropa and Pop. Edge: ATYCLB is not a roots record. We realized at a point during the Pop album that we were getting into musical areas that are not what we do best. As we delved more into the beat-driven sound, we had taken the sound of the band further and further away. The organic sound is what made us unique in the first place. GP: What were some of the things you learned from the dance influences that carried over to the new record? Edge: We were given a huge education in rhythm--pure and simple. Rock and roll started out as dance music, but somewhere along the way it lost its hips and became rhytmically simplistic. The emergence of hip-hop and dance culture has upped the ante in the rhythm department--and there's no going back. Listeners aren't going to accept lazy rhythms anymore. GP: Is there a song you can point to on the record that reflects that aesthetic? Edge: "In A Little While" is one. That track started out as just a band number, but when we finished, we felt the tune was a little too traditional--it hadn't found its own uniqueness. We put a drum loop on top of Larry's drums and then the song really came together. From our point of view, melding those elements is an incredible challenge. Now instead of building from electronic tools, we build up the material organically, and then add more modern elements on top of it. GP: Were Achtung Baby, Zooropa, and Pop such departures because you were looking to keep your music fresh? Edge: Yeah. We were very inspired by what was happening in dance music and hip-hop. Technology has always been a very important dynamic in pushing music forward. You can point to almost every important developments in music and see a technology that went with it. The fuzzbox launched rock and roll into the '60s. So for us, it seemed perfectly natural to be up to speed with the state-of-the-art technology happening in the dance culture. In that blend, we hoped we could hold on to the essence of what U2 is about. That's been, at times, a fine line you draw. We felt we crossed it ruding the making of the Pop record, and we had to bring things back a bit. GP: Did the more traditional band approach for ATYCLB make you look at the guitar differently? be in place first. I think the end result is our most "guitar" album since Achtung Baby. GP: Did you take a different tonal approach? GP: There are quite a few solos on the record. get off on finding the perfect tone for the perfect part. GP: So the songs that have solos were just begging for them? Edge: I think they were. For instance, "Kite" originally didn't have a solo. We had the tune almost finished, but we weren't quite happy with it--it needed a twist. So we edited in a section, I plugged my '64 Gretsch Coutnry Gentleman into a cool fuzzbox--and Ampeg Scrambler--and a Vox AC30, and I came up with a solo for it. It really made that part of the song come alive. that's a case-in-point where the decision to do a solo came from the sense that something was missing in the tune. GP: Do you have a guitar setup for slide? Edge: No. I play slide on various guitars in standard tuning. GP: You really mixed up the tones on this album. Edge: Well, I'm a fairly well established AC30 man, but lately, for a bit of variety, I've been moving away from the Vox. I used a 70s Hiwatt commbo for a lot of the distortion tones, and for many of the clean tones, I used an old Fender Bassman. GP: You can hear the Vox all over the record, though. Edge: I still used them quite a bit. I love the bell-like quality of the AC30. It has become a part of the way I play guitar. GP: "Elevation" has some amazing distortion tones. GP: What is that huge distortion sound that barges in during the main riff? GP: What were your main fuzzboxes? at the World", I'm using an Electro-Harmonix Micro Synthesizer for that mad distorted tone. GP: What's the massive wah-wah at the end of "Elevation"? Edge: That's us filtering the tone after the fact with an Electrix Filter Factory. A wah pedal is great for certain sounds, but many times dedicated filters--DJ-type boxes--have a little more to them. GP: How did you get the lovely clean tones in "Stuck in A Moment" and "In a Little While"? Edge: I have a great '50s Strat, and I plugged it straight into a Bassman. On this record, I often found myself simply enjoying the pure tone of the instrument. Again, that's kind of new for me. GP: Why do you think you enjoy the natural sound of guitar more now than 20 years ago? Edge: I suppose since we came out of this period in the late '70s and early '80s when punk was happening, some of the punk ideals really struck a chord with us. Things like moving away from the rock aristocracy of the time were a big part of how I played then. I wanted to step away from the prototypical rock guitar thing, and making the guitar tones more abstract was a way to do that. But now, it feels so fresh to really explore the natural tone of the guitar. GP: "Walk On" has some very classic Edge sounding parts. Edge: I mostly used a white Les Paul that I've had for a long time through the AC30. The solo on that tune is my Gibson Explorer through the AC30. circle musically--I'm drawn back to the Explorer. In fact, if you listen to the echo guitars towards the end of "Beautiful Day" the tone sounds like it could have come from the first record. It's so "that" tone. GP: What's so special about the Explorer? Edge: It just has this unique tone. In fact, I was surprised by how much the guys in the band enjoyed the sound of it. Adam, in particular, was so delighted to see it out again. He said, "This thing sounds like nothing else on earth!" It's a pretty special guitar. GP: You were the first guy a lot of people heard use the Whammy pedal. What attracted you to that effect. Edge: It was just such a dramatic, extreme effect. That being said, there are very subtle, beautiful things you can do with it. I used it on "Peace on Earth" for this bizarre, atmospheric, almost Chinese-sounding part. It's a 5th below and a 4th above. GP: You use the Whammy pedal in a more extreme way on "When I Look at the World". Edge: Yes. In the middle solo, I'm using it with an echo in the choruses. GP: Are you still using the Korg SDD-3000 delays? Edge: Yeah. Even though they are digital, they have a warm and musical tone. I find most digital gear very hard to deal with because the natural musical quality of the guitar is compromised. It takes all the beautiful texture away and replaces it with this glassy, artificial sound. That makes it gough to get inspired. GP: And do you stil run out of the +4db output of your Korg to push the front of your amps? Edge: I do sometimes.The unit has output attenuation controls, and I mess with those. It's a great way of giving yourself a cool gain boost. I did that with all the amps. GP: So even though you guys went for a more organic approach, it didn't go as far as recording to analog tape. another tape machine, you'd lose a generation of audio quality. GP: How was cutting tracks for the new record different than, say, the War album? lick--anything--and build up from that. GP: How does that approach make the material stronger? Edge: Everyone is listening in a different way because they are genuinely ucertain of what is going to happen next. You're able to work off the sense of discovery. There's a feeling you can only get from playing something for the first time. It's very exciting, and occasionally we'll hit on that feeling during the making of an album. GP: What's a good example of that on the new album? GP: It sounds like the guitar still excites you. new feelings and stop me from becoming too staid. Ironically, on this record that meant plugging a beautiful vintage guitar straight into a lovely vintage amp. That was pretty inspiring for me. GP: Do you see the guitar getting phased out of pop music? of rock and roll, and it *defines* it. GP: What is it about the guitar that still resonates with people? Edge: I think it may have something to do with it standing for freedom in some weird way--somewhat like the automobile has meant freedom for people over the last century. Since the invention of blues and rock and roll, the guitar has inspired that kind of feeling in people. And it probably always will. 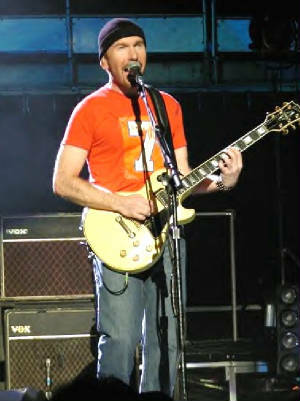 "Over that last three tours, I've felt the need to keep all of my tonal options open," says The Edge. "That meant having a Bradshaw rig with full MIDI capability so I could recreate almost any signal chain I used in the studio. But that's a hard task when I'm often recording the most extreme tones. A lot of times I'm overdriving something, and it's on the verge of burning up something else completely. Those kinds of sounds are hard to recreate with a technically balanced rig, which by it's very nature eliminates that kind of cacophony." The Edge's projected setup for U2's next tour will be a smorgasbord of guitars, rack processors, and stompboxes. His rack includes two T.C. Electronics 2290's, a Rocktron Repliflex, Eventide HD 3000, DigiTech 2101, SPX 1000 (for his main reverb), Korg A3 and an Electrix Filter Factory. For delays, The Edge is sticking with three Korg SDD-3000's and two AMS units. On the stompbox front, he'll be using Boss SD-1 Super Overdrive and OD-2r Turbo Overdrive pedals, an FA-1 FET (for signal boost), three DigiTech Whammy pedals, three Dunlop Cry Baby's, and a trio of Lovetone pedals -- a Meatball (envelope filter), Doppelganger (phaser/vibrato), and Big Cheese (distortion). All of this will go through five pre-1966 Vox AC30s and two Randall 1x12 combos. Although he is happy with this setup, The Edge does yearn for a less complicated rig. "Whenever I feel like going with a simpler rig, someone will inevitably say, 'Hey Edge -- remember the sound that we got on that tune? Can we get that sound?' I'll think, 'Man, that was eight pieces of gear strung together and run through a pair of headphones. How amd I going to recreate that in a stadium?'" How did you record 'All That You Can't Leave Behind'? We used an Otari Radar hard-disk recording system. Tracking to hard disk allowed us to move arrangements around and mess with them. In many cases, what hopefully sounds like a back-to-basics approach employed a lot of technology. In the end, if you can't hear the technology, I consider it a compliment. In your eyes, how did the band's stripped-down ethos affect the record? By coming up with ideas and working them out as a band, you get harmonious, musical surprises that layer doesn't afford. If you're making a beat-driven record, there is more of a tendency to layer because you start with a beat and build on top of it. The guys in U2 have a real appreciation for the exchange between musicians. You play guitar on six cuts. How did your guitar playing work into the scenario of the new album? Usually, if I'm playing, it's because we need another guitar and The Edge is busy playing another part. For example, I'll play an acoustic guitar while we're laying down basics, rather than having Edge overdub the part later. Again, doing it that way makes for more of an exchange between the musicians. So in some instances, you cut basics with the band? Yes, and so does [Brian] Eno. There's something magical when we all play together. The track "New York" is a good example. The band was upstairs having a meeting, and Eno came up with what I call the "tug boat" sound in the beginning. I worked up some chords, the band came down and added parts, and that was it. "Stuck In A Moment" is a another good example. That tune is essentially a live performance with the six of us. I'm playing harmony to The Edge's part. For electrics, I used my butterscotch `51 Telecaster and Edge's reissue Gibson Les Paul Goldtop. For my acoustic parts, I used a Gibson J-200 that Emmylou Harris gavem me. It has a Lawrence magnetic pickup in the soundhold that I run into a tweed Fender Champ. I set the Champ next to my feet and mic it. I've been using that sound for years. You can't quite tell if it's acoustic or electric -- a very lovely sound. What was the typical mic setup for The Edge's electric parts? Mostly, we would close-mic the speaker a tiny bit off-center with a Shure Beta 57 or 58. Sometimes we would put the Vox in a 4' x 12' corridor, and position a Neumann U47 or an AKG C414 six feet away. You can hear those tones on "Walk On" during The Edge's signature-sounding parts. Also, we placed a small Vox amp with an 8" speaker in an isolated room, ran the Whammy pedal to the amp, and recorded it on a separate track. That's the shimmering sound on "Peace On Earth." How did you mic his acoustics? We used the Shure Beta 58 with quite a bit of compression. Occasionally, we tried a fancier mic -- The U47 or the C414 -- but those were in the overdub setting. How would you describe the difference in The Edge's sound from Ther Unforgettable Fire to now? I think he's more interested in clarifying his sound and having it less panoramic. Although -- thankfully -- the panoramic stuff still shows up in a few places. Brian Eno and Daniel Lanois began working with U2 on 1984's The Unforgettable Fire. The two producers helped create much of U2's timeless work, from the hugely successful The Joshua Tree to the jarring, industrial-tinged Achtung Baby. Here, The Edge shares some thoughts on the recording of All That You Can't Leave Behind with these legendary sound sculptors. "It's easy to point to Brian's contributions in the studio," explains The Edge. "His style is to give you his personality with his keyboard playing, production suggestions, and the way he sonically treats various instruments. Sometimes you have to say "Brian, we're a rock band and we don't like ambient keyboards on everything," or "Brian, that idea is genius. Thank you very much." Next thing you know, we'll have a great tune. "Although Brian's original plan was for us to come into the studio with no songs and record twor or three weeks of improvisations, I have to say that didn't really work.. We ended up working as a band on song ideas and arrangements for a couple of months, then Brian and Daniel would come in and we'd work intensely with them for a little while. Then they woudl leave and we'd work by ourselves again. That was a good way to operate because when they came back, they were amazingly objective. The y had no idea of the emotional investment that went into one song or idea. That objectivity is always good to have in the studio. I feel that by working this way, we got the best out of each of them."